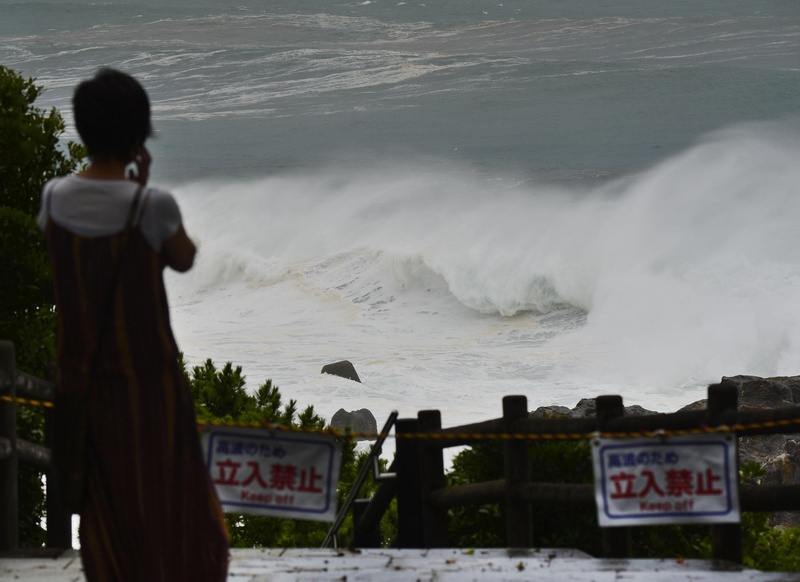 Two died, evacuation orders and recommendations were issued to some 555,000 people, and 32 people sustained injuries of varying degrees nationwide Friday as Typhoon Nangka headed north over Shikoku toward the Chugoku region in western Honshu. The Fire and Disaster Management Agency said that 11 houses were damaged and 55 were flooded. A 71-year-old man in Hyogo Prefecturea died after sustaining head injuries while trying to reinforce window glass, and the body of an 85-year-old man was recovered after he had apparently gone out to check on an agricultural canal. 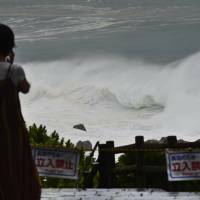 The powerful typhoon made landfall in Honshu at Okayama Prefecture early Friday after slamming into Shikoku on Thursday night, the Meteorological Agency said. 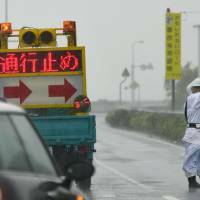 The agency said Typhoon Nangka was expected to continue heading north. 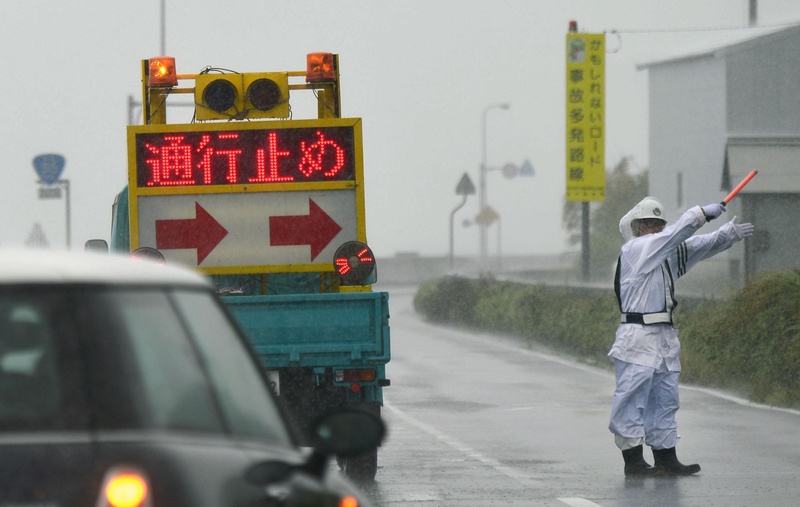 In addition to the deaths and injuries, the slowly moving typhoon disrupted traffic in wide areas of western Japan. 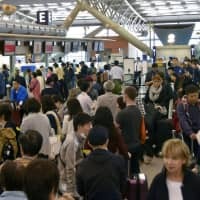 At Kansai International Airport, at least 48 domestic and international flights were canceled, while All Nippon Airways and Japan Airlines together aborted 31 flights at Itami airport in Osaka, affecting about 1,100 passengers. West Japan Railway Co. said it canceled 110 limited express train runs and totally or partially suspended local train services on its nine lines, affecting about 200,000 people. Shikoku Railway Co. shut down all services Thursday evening. 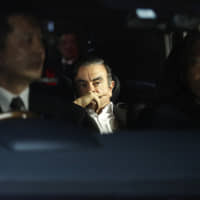 The Kobe Municipal Government issued an evacuation advisory to more than 70,000 people in about 33,000 households at 10:50 a.m. The Meteorological Agency warned of storms and heavy rains for the next few days. Total rainfall reached 740 mm in the village of Kamikitayama, Nara Prefecture, 690 mm in the town of Odai, Mie Prefecture, and 660 mm in the village of Umaji, Kochi Prefecture. 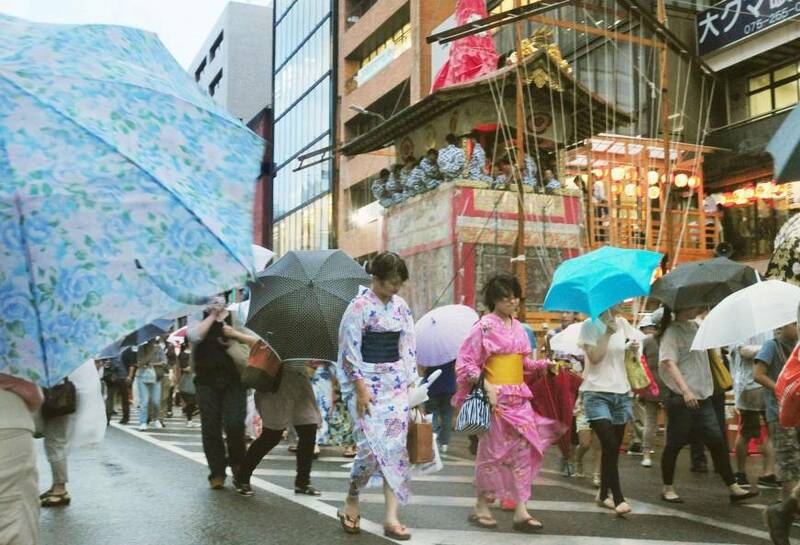 Early Friday, the hourly rainfall reached 84 mm in the city of Saijo, Ehime Prefecture, the agency said. 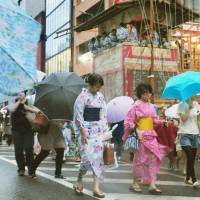 Many parts of eastern and western Japan could see heavy rains of more than 50 mm per hour, it warned. 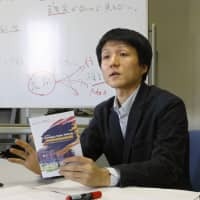 In the village of Kawauchi, Fukushima Prefecture, the hourly rainfall reached 77.5 mm, a July record there, while winds of at least 144 kph were recorded at Cape Muroto, Kochi Prefecture. The typhoon was moving north at a speed of 15 kph as of 11 a.m. Friday. A steel gate was found collapsed at an elementary school in the city of Okayama, but no one was injured.